These five offshore cruisers deserve the attention of any sailor looking for a relatively affordable boat that can go the distance. 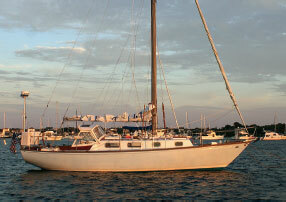 When I was asked to highlight five top affordable bluewater cruising sailboats, about 30 models popped into my head. How do you pick just five? 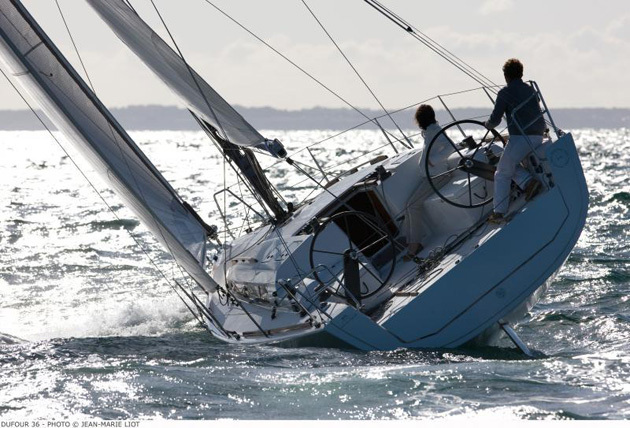 With these considerations in mind, here are my picks—five top choices for affordable bluewater cruising sailboats, listed here in alphabetical order. 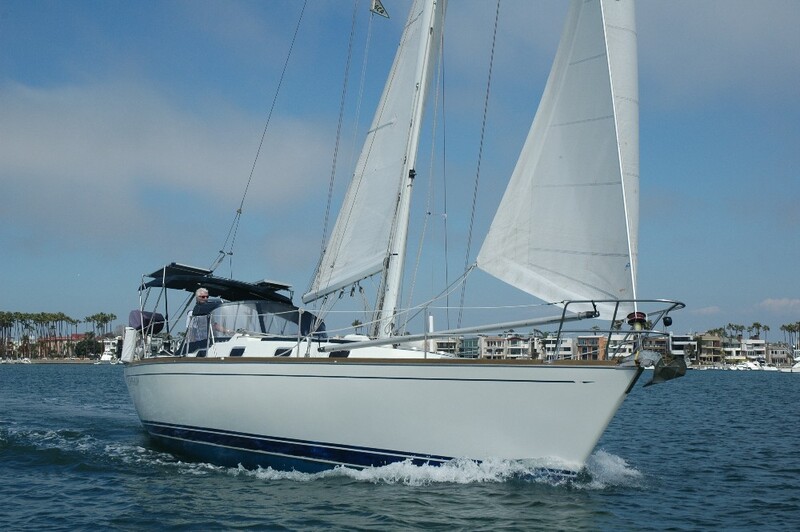 With plenty of cockpit space and a spacious cabin, the Caliber 40 LRC works well for entertaining as well as cruising. In its original form, the Caliber 40 design appeared in 1991. Through its evolution into the 40 LRC it remains a very attractive cutter, with a bowsprit that gets the ground tackle well away from the bow during anchoring. It has a fully encapsulated, elongated fin keel and the ballast to displacement ratio is a very respectable 44 percent, which is good to find on a boat intended for bluewater use. 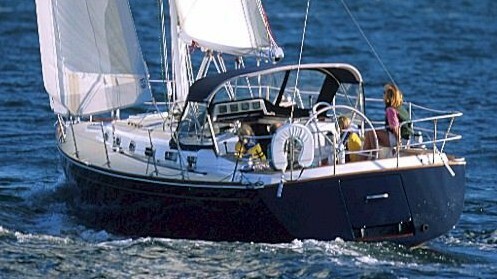 The T-shaped cockpit is roomy and excellent for entertaining, but also deep and safe at sea with three large cockpit drains and high back rests. The single spreader, keel-stepped rig is easily managed by a couple or by a singlehander. 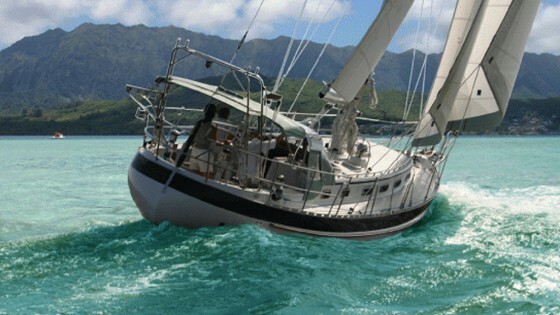 The inner forestay can be brought aft and secured at the deck near the mast; or it can accommodate a roller furling staysail that, along with the running backstays, will be very useful in a big blow. Water tankage is good (156 gallons) but fuel is a measly 46 gallons, which may need to be modified for extended cruising. New Caliber 40 LRC models go for around $350,000, and those 10 or so years old range through the low $200,000’s. 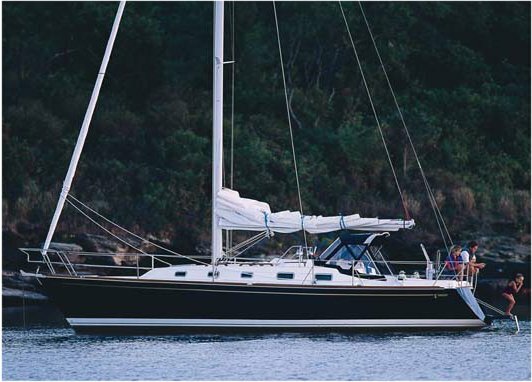 The two-stateroom/two-head cabin in the Hylas 46 is larger than most, and includes some smart design features. Hylas is a semi-custom builder with lots of model options, so we’re playing fast and loose with the price limit, but if you hunt around you should be able to find one within our parameters. 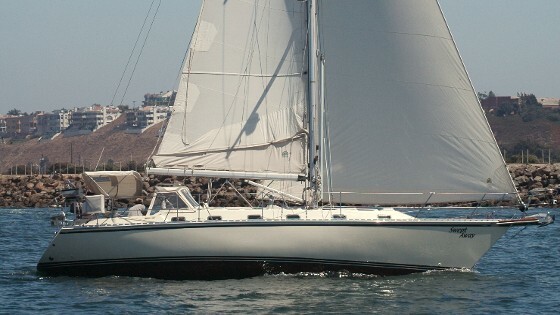 The Hylas 46 is a cutter-rigged sloop with a center cockpit and a modern underbody. 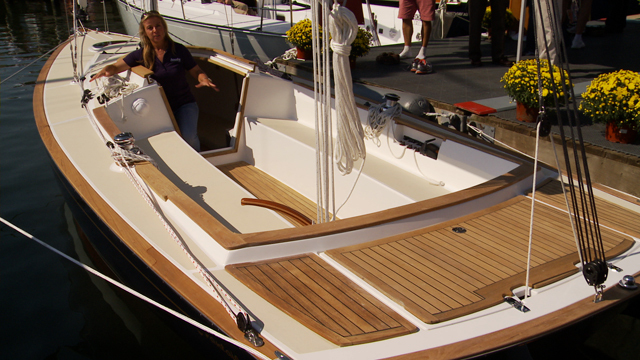 They’re low, sleek, and fast, with almost no exterior teak and a great multi-step transom for easy boarding. The interior is outstanding with two cabins and two heads. The master is aft with a walk-around island bed and a head with a separate stall shower. The forward cabin has a head in the bow and a Pullman berth in the guest cabin. The galley is down the starboard walkway and the saloon is open and inviting A nifty feature is the way the companionway steps swing out to reveal access to the engine. Island Packet builds distinctive, full-keel boats that have a cult-like following. The Island Packet 420 is a solid glass, heavy cruiser that won’t set any speed records but will get you there in safety and comfort. The distinctive beige gelcoat makes them easy to pick out in an anchorage, as does the traditional bowsprit and useful cutter rig. The 420 came out in 1999 and today you may be lucky enough to get a 2000 to 2002 model for $250K. These sturdy, aft cockpit boats boast good water and fuel tankage, a nice 2/2 layout, and an optional shoal keel (4’ 6”) for skinny water destinations. The 420 is not offered as a new build anymore; it's been replaced by the 460/465, which carry on the Island Packet tradition of building solid bluewater boats that aren’t all things to all people but have exactly what some people want. Although Tartan’s have been around since the 1970s, Tartan’s current designer, Tim Jackett, brought some unique features to the latest mix on the 3700. The Tartan 3700 is a design that has stood the test of time; it is still being built new today more than a decade after its launch. The double spreader rig is all carbon fiber so it’s lighter and stronger than aluminum, and uses Tartan’s unique “Pocket Boom” for easy mainsail management. For stress-free shorthanded sailing, there’s a self-tacking jib for when the wind is up and a 150% reacher on a roller furler which will keep the boat moving in light air. 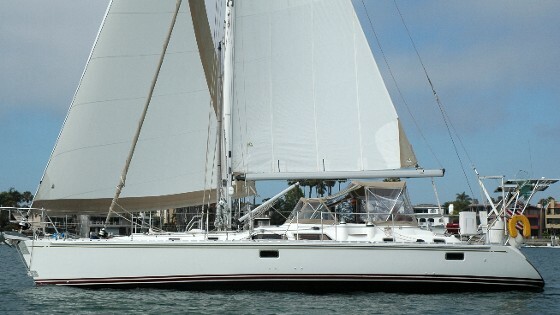 The 12’ 7” beam is carried well aft for good stability, adding a topside flare for good room on deck and in the cockpit. The transom folds down to create a nice swim platform, which also makes for easy boarding and loading from a dinghy. Below, the Tartan 3700 has two cabins and one head with a stall shower. The saloon has the space of a much bigger boat and there’s a full-sized nav station which is perfect for long-distance cruising. A new 3700 will set you back around $400,000, and 10 to 12 year-old Tartan 3700s list for between $170, 000 and $220,000. Valiants are tough as nails, double-ended, cutter-rigged sloops. I’m also stretching the price tag a bit with the Valiant 42, but an early 2000s model may be had for under $300,000 and older ones will be slightly less. The design concept grew out of the hugely popular, Bob Perry-designed Valiant 40 that was in production from 1973 to 1992, when 200 hulls were built. Their traditional looks belie a nimbleness that more or less started the idea of a “performance cruiser.” Not much has changed on these boats over the years so going aboard is a bit like stepping back in time, which is exactly what appeals to many of their buyers. The downside is that tankage (water and fuel) is pretty light, with both under 100 gallons. 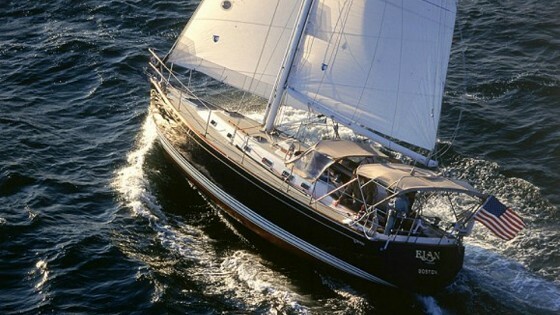 However, the boats are extremely practical with little exterior teak, a very versatile aluminum toe rail, and a compact, ocean-going aft cockpit. If you ask three sailors what the best cruising sailboat of all time is, you’ll get at least five opinions. These five were selected because they are affordable, recent, and in one form or another, still built. There are older and less expensive models still plying offshore waters today—and newer and more expensive models that have taken cruising to a new level—but these five affordable bluewater cruisers certainly merit your attention. 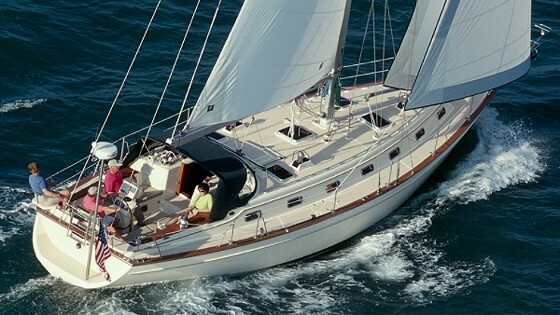 For information on cruisers that cost even less - some a lot less - see Classic Plastic: 10 Affordable Used Sailboats for Cruising. -Don’t see your favorite affordable bluewater cruiser included here? Leave us a reply in the comment box below, and let us know what it is!